When it comes to puppy beds, owners want to make sure, that they are getting the best puppy bed available. Puppy beds come in different styles and sizes, and you would need to make sure to get one that fits your puppy perfectly, while also fitting the space of your house. These beds allow puppies to comfortably rest on them. A puppy bed also helps keep your loved ones warm, compared to simply lying on the floor. As there are so many products to choose from, here are the best dog bed reviews! This puppy bed is made out of 4-inch memory foam. Its twill consists of 65% polyester and 35% cotton. This is guaranteed to provide your puppy with the comfort it needs. Not only will your puppy feel comfortable, but this memory foam is also known to reduce joint pain and improve general health. When your puppy gets a good rest, they will have more energy and their mobility will increase. The cover is also water-resistant and tear-resistant. This makes this puppy bed extremely durable. It comes in three different sizes and your puppy is sure to fit one of these sizes. Cleaning the cover is also very easy, as the cover is removable and can be washed in the machine. For those who have had difficulties with this, this product guarantees that the cover will be easy to put back on again. If necessary, covers are also available separately and you can always get a new one. The design of this puppy bed is made to fit and look good with all kinds of home interior designs. All in all, it is made out of premium quality and is a puppy bed that will serve your loved one for a long period of time. 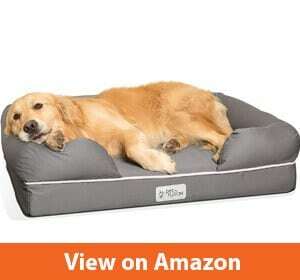 This puppy bed is suitable best for dogs who are oversized and weigh from 70 to 110 lbs. Its outer dimensions are: 52 inches L x 35 inches W, while its inner dimensions are 46 inches L x 30 inches W. The booster is 14 inches high, while the cushion is 10 inches high. The base of this puppy bed is made out of waterproof 300/600 denier, giving you a peace of mind that even in case of any spills, it won´t tear. The material of the bed is of premium high-quality polyester. The puppy bed can be washed in the machine but is not suitable for the dryer. It is important to always air dry the puppy bed, to avoid damaging it. This puppy bed has been specially made to provide your puppy with the best spine support and it helps straighten the spine of the puppy. When getting the rest that they need, your puppy will immediately be more energetic and more mobile throughout the day. 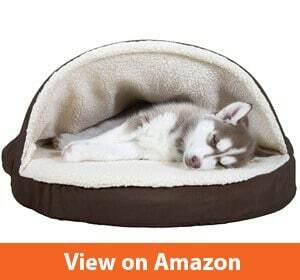 This puppy bed also comes in a small size, for puppies weighing up to 25 lbs. The smallest size is believed to be the best one for breeds like beagles, Boston terriers, Springer Spaniels and similar. The largest size of the dog is for those who weight more than 70 lbs, which includes breeds such as Rottweilers, German Shepherds, Newfoundland and more. This puppy bed is great for puppies who are more than 40 lbs in weight, 25.6 inches long and have a width of 20.1 inches. 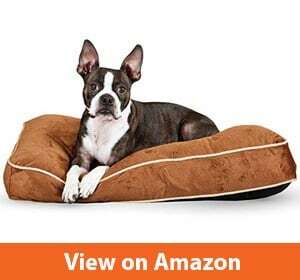 This one is not only a puppy bed, but it can also be used as an outdoor cushion. If you have an outdoor dog house, this puppy bed can be easily used for additional support there. This pet bed can also be extended and turn into a puppy bed with a cover, for the additional warmth your puppy might need. The abilities with this puppy are unlimited and you can even use it as a car seat, if planning long trips with your puppy and want to make sure that they have the best possible comfort. Lastly, another great way of using this puppy bed is to place it on the sofa. The velvet fabric of this multi-use puppy bed is very soft and warm, making sure that your puppy is more than comfortable when in it. 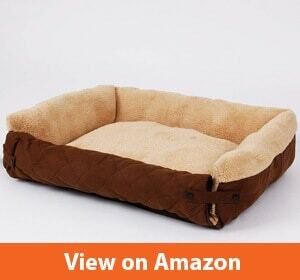 The inner layer is made out of polyester and has the function of adding additional warmth to the puppy bed. The best way of washing this puppy bed is by hand washing and spot cleaning, however, it is a puppy bed that can be washed in the machine as well and should then be left to air dry. This pet bed comes with two mats, one larger and one smaller one. The larger mat has the size of 28.5 inches x 34.5 inches, while the small mat has the size 17 inches x 11 inches. This puppy bed comes with a mylar fill, a material that is extremely insulating and self-heating. This material uses the body heat of your pet and insulated the pet from the cold floor. It is also extremely comfortable. 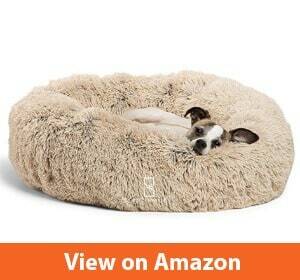 The cover of this puppy bed is a velvety one and it is padded with hypoallergenic foam, which is thick, but soft. This foam is very durable and guaranteed to stay springy for a long period of time. The under the bottom of the pet bed is rubberized, which provides with extra support. Wherever you place the bed, it will be firm to the floor due to the rubberized base and slipping should not be a worry of yours. This pet bed is great for cats, but also amazing for small puppies as well. It can be easily folded into a small size, so if you´re planning to travel, taking this bed with you will be extremely easy and it won´t take up too much space. This puppy bed is best hand-washed. This luxury puppy bed is specially made to relief any types of muscle or joint pain, your puppy might have. The orthopedic material is specially made to improve the general health state of your puppy. It is finished with faux fur, a fur that reminds the puppies of a mother´s fur coat. This helps the small puppies feel more at home and more comfortable. The comfort of this fur is amazing and your puppy will be able to get a restful sleep. When sleeping restfully, the puppy will not only have better health, they will also behave better throughout the day. It comes in different, natural colors, making them a great addition to the interior design of your home. The material is water-resistant and dirt-resistant. It won´t mess the puppy bed and won´t mess up your floor either. The mattress of the bed is puppy-friendly. It can be easily washed in the machine and it can also be dried in the dryer. In fact, it is best to dry it in the dryer and never air dry, as this may lead to matting of the fur. This makes this puppy bed one of the easiest beds to take care of. If your puppy has excessive teething or chewing behavior, this puppy bed might unfortunately not be the best one, as it may tear. The K&H puppy bed is overstuffed, which will lead to your pet feeling extreme comfort while laying on it and getting the best rest possible. It is important for your puppy to get a good rest and feel comfortable, as this will improve their health and the way they behave. It is also important to protect your puppy from the cold floors and this puppy bed does just that. The top layer of the best is separated from the bottom layer, a structure that leads to the perfect balance on the entire bed. It comes in different sizes and different colors, making it easy for you to choose a size to fit your pet, while also getting a color that will look good in your home. Washing and caring for this puppy bed is easy! The cover can be simply removed and should be washed with cold water on a gentle cycle. It can also be dried in the dryer, but only when using the no-heat option. It is, however, best when air dried. A good point to note is that this puppy bed is not waterproof. In case of accidents, a cleaner should be sprayed to help remove the stain. 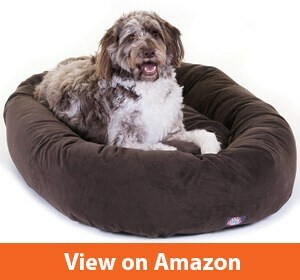 This pet dog bed has a diameter of 26 inches and comes in an espresso color. It is made out of polyurethane foam. The egg-crate foam is orthopedically designed to provide the best joint support for your pet. This is especially helpful in relieving any joint tension your puppy might have and is extremely helpful in the improvement of the general health state of your pet. It is also helpful towards soothing any pressure points and allows your pet to get a good, restful sleep. Getting a restful sleep not only improves the health of your pet, but it will also lead to a better behaving of your pet. The surface of this puppy bed is made out of faux sheepskin, which is skin-friendly, soft on the paws and the nose of the puppy. While smaller beds need to be washed entirely, this bed has a cover that comes with a zipper and is very easy to remove and put back on. 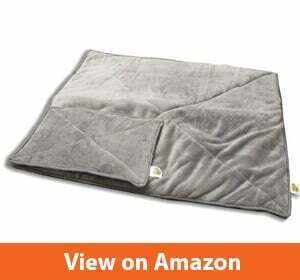 The cover is machine washable, allowing for easy cleaning. The extra comfortable puppy bed is available in four different sizes, so the right size for your puppy should be included as well. The color and design of this puppy bed is believed to only improve the home décor of any type of interior design. Breed: The breed of your puppy will help you choose the right bed. Breeds who have short hair or are completely hairless need beds who provide with extra warmth and even better, beds that are heated. Breeds who have extra-long hair or double coats, usually don´t need the extra warmth as this can lead to overheating. For these breeds, dog cooling pads are a good option. Size: Measuring your puppy is important, to make sure that you get a bed they best fit in. Dog product reviews are sometimes a good help, if you are unsure of how to measure. When considering size, make sure to remember that your puppy will grow, so you might choose a puppy bed that your pet can grow into. Material: The material of the puppy bed is essential, not only for the comfort of your puppy but for you as a dog owner as well. Some materials are more durable than others and some materials are easier to clean than others. Orthopedic memory foams are believed to be the best option, because they are specifically designed to provide your pet with the support they need. They help relief any joint pain and if your puppy has a condition, an orthopedic bed will improve their health. Chewing behavior: If your puppy is a chewer, you might not want to get just any type of bed. Chewing behavior can lead to tears of puppy beds pretty quickly, leaving you needing to buy another one pretty soon. There are special beds made for chewing puppies, that are tear-resistant. If you know that your puppy has this type of behavior, better invest in a tear-resistant bed. In conclusion, there are many types of puppy beds to choose from and the decision should not be made without putting thought into it. It is important to choose a type that will provide your puppy with the needed comfort, while leaving you satisfied too. There are many different colors and designs that can be an addition to the decor of your home. There are portable dog stairs available, which can allow you to place the puppy bed in different places in the home. The best puppy beds are those, who make the puppy happy, while making the puppy owner happy as well!